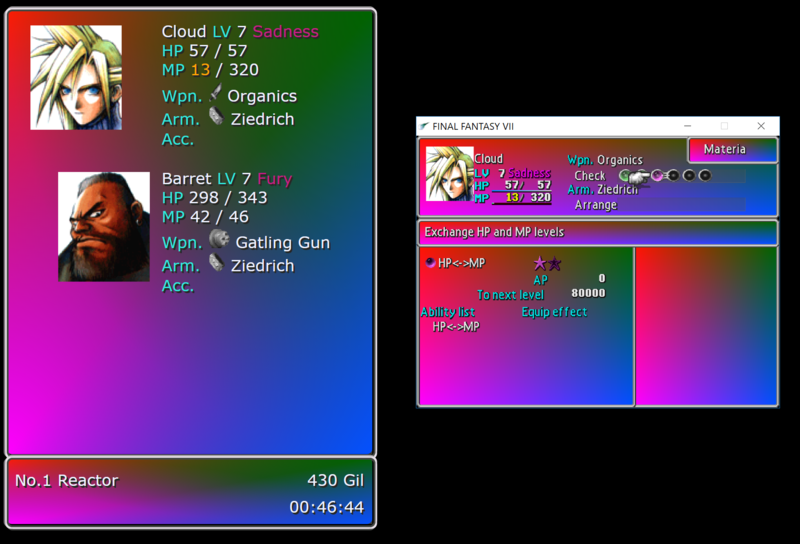 Tseng is a tool intended for use by streams of content producers to keep a party tracker to the side of the game, featuring current status, health and equipment. It is very young, and still very pre-release so far, so there may be issues. Please report any and all issues you come across. Displayed as a browser page - suitable for OBS browser source! You'll need to first make sure you have .NET Framework 4.6.2 installed. 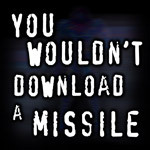 If not, you can get it from Microsoft directly. Get the latest version of Tseng above. Kickass. I considered making something like this myself several years ago, but didn't make it far on account of intense laziness. Laziness is definitely a thing. Glad you like how it looks this early in it's life though! It is a fantastic idea. I have lots of memory addresses labeled if you want more metadata. I've got them somewhere as well. Very thankful for the help you've been so far! Just tell me what you want and I probably have it. I've envisioned random numbers, but they change every frame and by the time your program read/displayed one it would be stale. Anything else though let me know. AI variables? Timebar values? Status time remaining? etc. 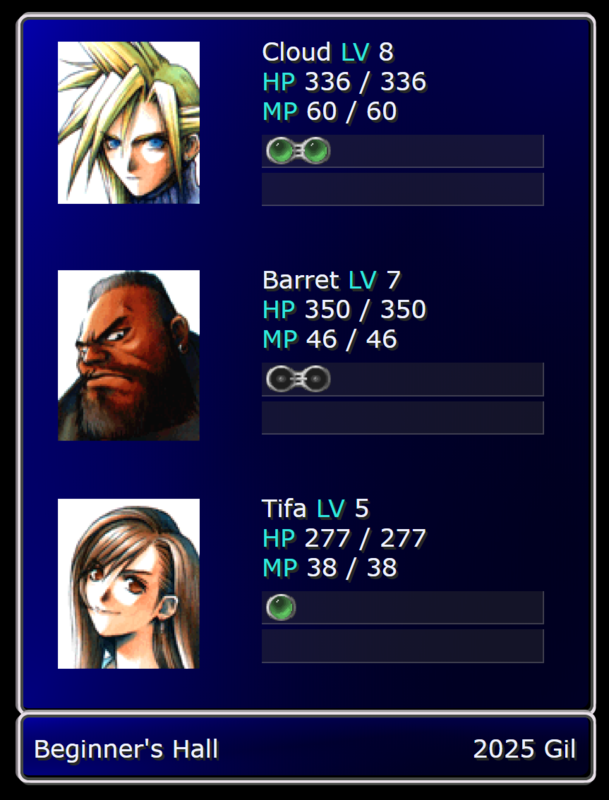 Do you happen to have the offset for row information for battle actor? An active bit 6 indicates the actor is in the back row. An active bit 5 indicates that actor is defending. Aye I sent him this - however, I think it's bit 0x40 and 00 ? Yeah, that's what I meant. Active bit 6 = 40h. haha oh aye. Not sure what I was thinking. I blame this cold I'm dying with. 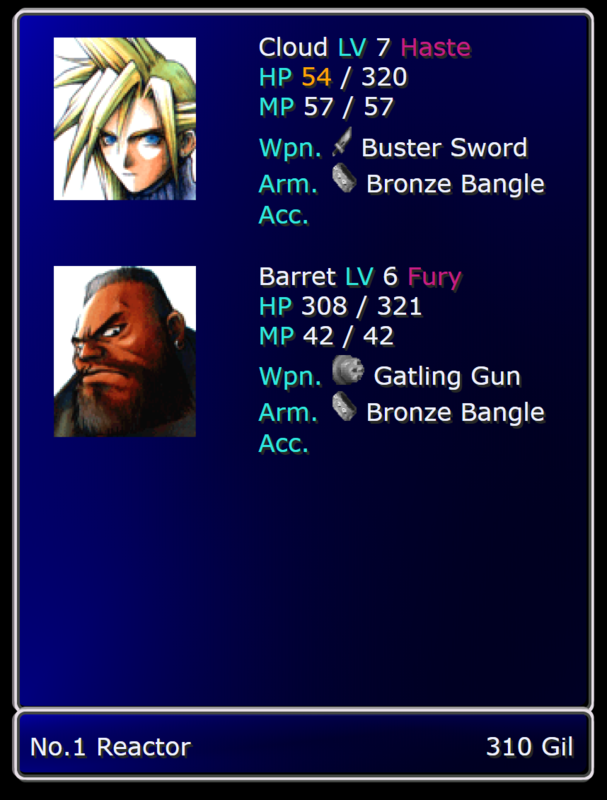 I'll take a look at including the defend; that seems like it'll fit on the status spinner easily enough. Do you happen to have a doc with the addresses noted in, or is it more looking up previous work to find stuff? What is bit 4 about NFITC1? I noticed 08 was always set. A bit of both, actually. Funnily enough I started out a spreadsheet on Excel, then my trial ran out and I'm too cheap to buy a copy of office so I just keep opening it in read-only mode. Whatever I can't find on the spreadsheet I dive into my debugger which has lots of comments on various addresses. It could be one of three things: active actor (animations/effects/scripts run), active target (can be targetted), something else I can't remember related to vulnerability. It's AI address 4023 and that's usually unset in boss death scripts IIRC. 4020 and 4022 are unset on death as well so those would be the other two. Bit 4 would be 10h. 8 is bit 3. 8 I have listed as "Enabled" which means they can be targeted. For allies this is active as long as they are not imprisoned since you can target "dead" allies. Hah! Yes. I meant 4th bit / bit 3. Have you considered opening it as a google doc, or using Libre Office or something similar? Both are free and support Excel In either case, is it a document you'd be willing to share? Mostly for my own fascination, and partly for potential use. Or would you prefer if I were to ask about individual things on a case-by-case, where I can't find them elsewhere? I am using Libre Office to make a few adjustments here and there. I don't care if there's a google doc, but I don't want to bother setting it up. I'd be willing to give you what I have, but it might not make a lot of sense. This one reconnects if the game drops, and doesn't have to be open first. It'll also open the browser window for you once it's loaded.